My ongoing research for the Notations 21 Project goes beyond that of the book. There are so many incredible new ideas about notation and performance that I knew the book was just the starting point for me in many ways. 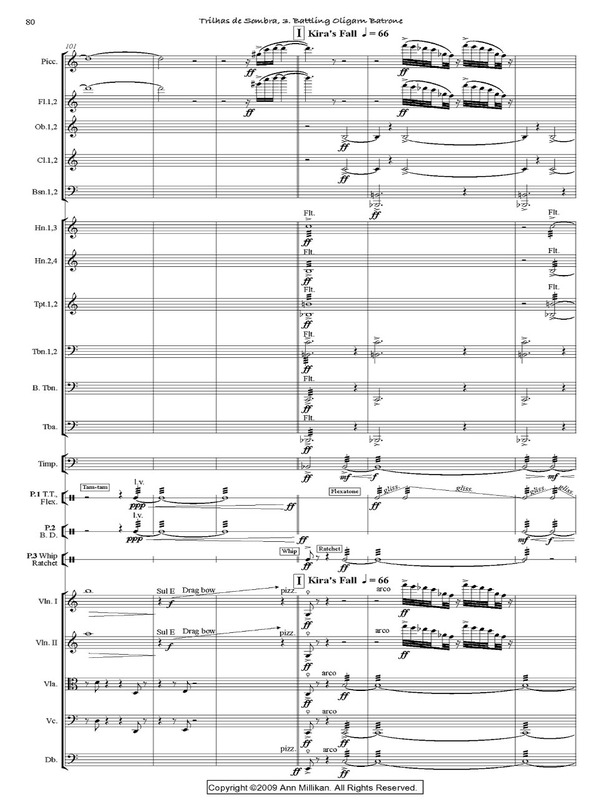 I am still asking questions, discovering new visual scores and realizing that the composers in the book are still creating beyond all that I could imagine. One of these extraordinary composers from the Notations 21 anthology is Ann Millikan. I was so impressed by her innovative work years ago and even more so now. Because of my interest in why composers choose to develop new notation for their works, I chose to discuss this issue with Ann since she uses new notational techniques in many of her works. She responded by saying that many times there is no other option but to create something new on the score. But was there another reason to use what may be called “experimental” notation? I continued questioning Ann about her ideas. Creating a level of unpredictability in the performance of her work leads to innovative notational choices as well. She says, “Prior to becoming a classical composer I was a jazz musician, so making the transition to composing aleatoric works for classical players was something I was interested in right away. While most jazz improvisation cycles around the form and harmonic progression of a composition, an aleatoric work can be much more linear and open-ended. I didn’t want my conversation with Ann to end without including some discussion of her work that is included in Notations 21. 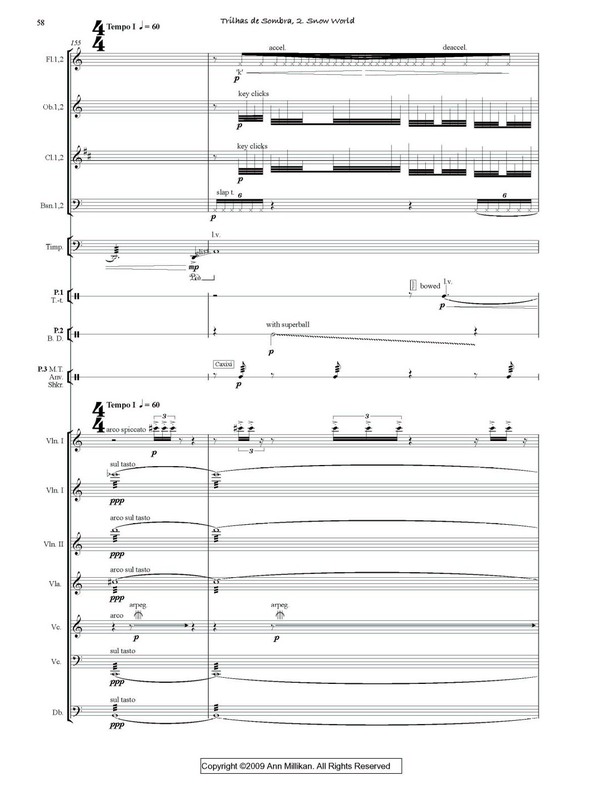 The notation used in the selection from HOUSE OF MIRRORS is visually fascinating and I wondered why she chose to create this very novel notation for this work. The desire to alter the performer’s thoughts and challenge them in new ways was her immediate reply. But I wanted to know more, of course. HOUSE OF MIRRORS is a set of works she began developing in 2000. The piece focuses on the internal experience of the performer. Thought, kinesthetic awareness, and the inner ear all play an integral part in the development and performance of the piece. The object is to create a realm where the performer is surrounded by sound and stimulus both internally and externally. Various materials are given to stimulate improvisation: the score, resonant surfaces which are excited by using modified speakers, and “sound boxes” that are manipulated with the feet. Ideally the performer forms a relationship with the score over a long period of time, but because the piece is tech intensive, so far that has been difficult to achieve. She is currently in the process of developing the HOUSE OF MIRRORS Pilot Project. It will include a HOUSE OF MIRRORS installation at Zeitgeist’s Studio Z, working with musicians and non-musicians for a week to a month, and documenting the process on video. She is interested to discover how the performers’ relationship with the piece deepens over time. From there she wants to develop a sustainable mobile installation format that she can take to festivals worldwide. Theresa Sauer is the author/editor of Notations 21, an anthology of innovative visual notation from around the world. She is the Director of the Notations 21 Project. She lectures, curates exhibits, produces concerts, and also composes music using innovative music notation. She is in the process of developing a documentary about Notations 21.